Metalforming companies anticipate a downward trend in business conditions through September, according to the July 2018 Precision Metalforming Association (PMA) Business Conditions Report. The monthly report shows that only 24 percent forecast an improvement in economic conditions, while 53 percent expect no change and 23 percent anticipate a decline in activity. Read more. A national study conducted by Lab42, a Chicago-based market-research firm and commissioned by the Steel Market Development Institute (SMDI), Southfield, MI, finds Americans in the market for new vehicles consider steel as the automotive material of choice. Additionally, a second study conducted by Ducker Worldwide, with North American headquarters in Troy, MI, shows the steel industry has made significant strides in developing advanced grades of steel and making them commercially available. Current and potential consumers view steel as critical to key vehicle attributes such as safety, strength and durability, and favor steel vehicles over brands relying on aluminum. Read more. Nordson EFD's MicroCoat® system uses LVLP (Low Volume, Low Pressure) technology to evenly coat stock while reducing oil usage up to 85%. This non-contact solution can be customized to any precision metal stamping application and is guaranteed to apply a consistent lubrication coverage while extending tool life. Learn more. Moves So Much Air, EXAIR Patented It! 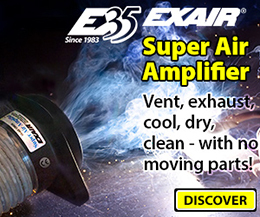 EXAIR Air Amplifiers are a simple, low cost way to move air, smoke, fumes, and light materials. Using a small amount of compressed air as their power source, Air Amplifiers pull in large volumes of surrounding air to produce high volume, high velocity outlet flows. Have a manual production task that could benefit from automation? 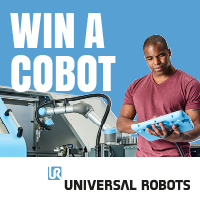 Tell us about it and win a Universal Robot! Perhaps a monotonous task that your employees would happily swap for one that requires problem solving skills or a task that needs to be carried out faster to stay competitive? Enter now. 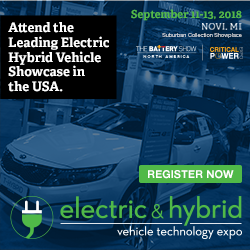 The Electric & Hybrid Vehicle Technology Expo is part of North America's largest industry event, bringing a comprehensive showcase of electric & hybrid manufacturing, advanced battery, and critical power technologies onto one show floor. Discover everything you need to make faster, smarter, and more cost-effective products at the most comprehensive event. Register Now! Nationally, 21,000 registered programs had more than 505,000 apprentices enrolled a couple of years ago, a figure that has climbed 29 percent since 2011, according to the U.S. Department of Labor. Read more. • August 16, Identifying Parts for Additive Manufacturing. Speaker: Kyle Adams, Application Specialist, SLM Solutions NA. Attendees will gain an overview of how to assess their components to take the first steps of implementing a metal additive-manufacturing strategy. Speaker: Kyle Adams, Applications Specialist, SLM Solutions NA. Learn more and register. • August 23, How Metal Additive Manufacturing Delivers New Efficiencies in Lightweight Parts. Speaker: Bryan Newbrite, Advanced Aerospace Applications Leader, 3D Systems Corp. Learn to increase part functionality while reducing part weight and optimizing material usage. Learn more and register. 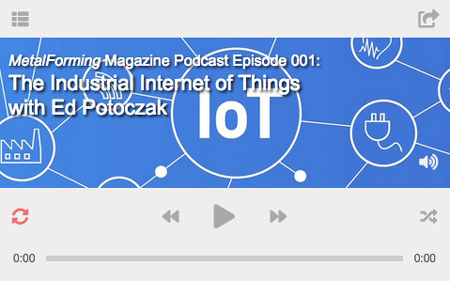 Ed Potoczak, managing member of the Oakstone Group, an industry-improvement consulting group in Rochester Hills, MI, shares with Brad Kuvin, publisher/editorial director of MetalForming, his insights on IIoT and how it will impact small and medium-sized metalformers and fabricators. 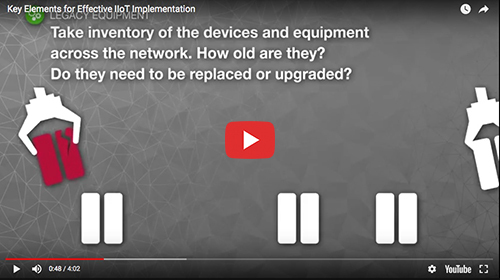 What should your IIoT strategy look like in terms of staff, infrastructure and security? The Servo Technology Conference, presented by MetalForming magazine and the Precision Metalforming Association, brings you state-of-the-art servo technology used in presses, transfer systems, coil-feed lines and more. The event will provide technical presentations and case studies describing how modern servo-based equipment can help stampers improve productivity and quality. Learn more and register! Kick off 2019 with a must-attend, info-packed event, the Metal Stamping and Tool & Die Conference, January 29-30 at the Nashville (TN) Airport Marriott. Presented by the Precision Metalforming Association in association with MetalForming magazine, the conference features keynote presentations, educational breakout sessions for stamping and tool and die, exhibits and a networking reception for more than 200 attendees and sponsors. 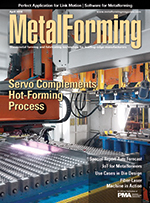 Track sessions feature new, emerging, evolving and maturing technologies and industry trends that are impactful to metal stamping, die design and die construction companies. Get details and register. …courtesy of its expertise in die design and build, and its deep-draw capabilities, with new hydraulic presses providing a big assist. 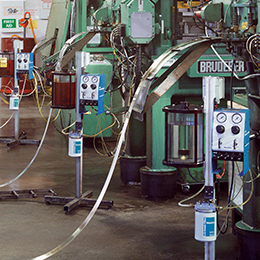 Now may be the perfect time to consider a retrofit or new press purchase.